Piano Lessons at Home or Teacher's Studio? Piano Lessons at Home or Teacher’s Studio? If you are wondering if whether you should take piano lessons at the comfort of your home or at your teacher’s studio. Here are some general guidelines to help with determining your preference. Let’s start by talking about the advantages of piano lessons in your teacher’s studio. 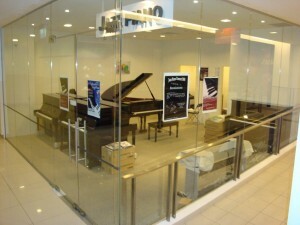 Firstly, a professional music studio is a representation of the quality of the teacher. It requires a substantial investment to set up a proper studio with the necessary instruments, equipments and supplies. We can all agree that we will not venture into such an investment unless we are extremely serious about it. Hence, teachers from these studios tend to be serious in their teaching. Instrument Digital Interface (MIDI) helps to open up more avenues for educational opportunities. Aside from MIDI, there are also multimedia presentations available to aid the teacher in explaining the music instructions. Thirdly, a studio tends to be stocked up with various equipments and supplies. Thus, should there be anything that a student requires during the lesson, the teacher will be able to gather it in a moment’s notice. This includes music CDs, music sheets, books and even online videos on Youtube. Hence, all of these will be readily available once the student requires them and he/she won’t have to waste money to purchase them. Next, we shall take about the advantages of having piano lessons at your own home. Firstly, by having piano lessons at home, you can benefit financially. You will definitely save on transportation costs from home to the music studio and back home again. Furthermore, if you’re driving to the studio, you can save on both petrol and parking fees. Secondly, aside from financial benefits, you will also save time on travelling. You won’t have to worry about making preparations before going out of the house, the waiting time for transport and the journey itself. This can probably save you at least half an hour unless the studio is underneath your block. Thirdly, if your child is the one attending the lesson, then you as a parent will be able to participate in it. This allows you to play a more active role by being able to see and hear your child’s learning progress. You can also help to influence and motivate them to ensure a more enjoyable learning experience. 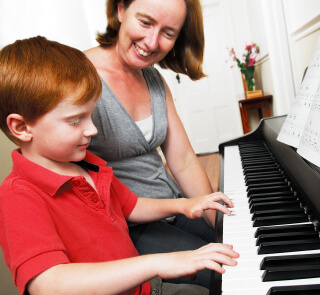 Finally, piano lessons at home enhances your child’s learning experience. When they are allowed to learn and practice on the same piano at the same location, chances are higher that they will remember the concepts and retain them. However, when they are required to travel to another destination for the lessons, chances are they will forget what was taught once they reach home to practice. Apart from that, when a student goes to another location for his/her lessons, there are times when they will forget to bring some of the essential materials. This will cause the lesson to be less effective as the student doesn’t have the necessary materials to begin with. However, if the lessons are conducted at home, the materials will be readily available and the “forgetfulness factor” will thereby be eliminated. As it can be seen, there are different advantages when it comes to having piano lessons conducted at home and at a teacher’s studio. What’s most crucial in deciding which is more beneficial would definitely be the learning benefits. Hence, before deciding on home or studio piano lessons, always refer back to the pros and cons of each of them. We hope that this set of guidelines are useful for you in determining which is a better choice.